Belkin wireless usb adapter ( Belkin wireless usb adapter N150 ) are for those who wants to connect to the internet but without connecting any wire to their desktop also laptop (if laptop does not have built in ) . Let me clear – What is wireless usb adapter ??? _ Wireless usb adapter means you can share your content or any thing else without connecting tons of wires to your lovely computer . There are many advantages of using wireless adapter ,as there is no need to take all of your wires and modem with you when shifting your computer from room to room . Now have a look at Belkin wireless usb adapter N150 . 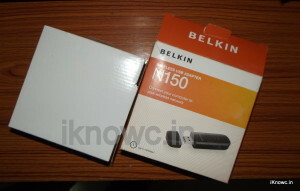 The first thing that you will notice while unboxing Belkin wireless usb adapter N150 is its solid and safe packaging . There is one solid made cartoon box in the box of N150 and N150 is placed in it with one CD for software installation and nothing else is there in the box . Belkin N150 is very cute looking device . It has very nice glossary and slippery finish over the front . The built Quality seems to be robust and hopefully it will surely last long . The body is fully made of plastic other than usb port . The device does have one led which blinks while receiving and sending signals . We really don’t have any issue with the built of the device ( Belkin wireless usb adapter N150 ) . We tested the device for about 2 weeks . The out put that N150 delivered us is good (7.8 out of 10 ) which seems to be nice for the device at this price . The device can easily work with any wifi router or hotspot without any glitch . 2nd test – we placed the wifi router at 60 feet away from Belkin wireless usb adapter N150 this time we are in close room with door open and the result we get is 3 signals. 3rd test – we placed the wifi router 100feet away from the N150 this time it gives some time 3 and 2 some time , which is again nice . Our opinion – The device is very nice and good at signals strength at this price . When your modem is in other room and you are in another then some times it would looses signals but not happened in our case we usually got 2-3 signals .